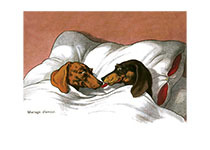 These two dachshunds have, as the caption says, a Mariage d'amour, as is obvious from their affectionate attitudes toward each other. The illustrator, Fritz Quidenus (1867-1928) was born in what is now the Czech Republic. He mostly worked in Munich as a painter and designer. His been steins for Villeroy & Boch are sought-after collector's items, as are his paintings and drawings.